- In the Plane of Fear, a harbinger of Fear can help adventurers get their epic 1.0 pieces that would normally drop from Cazic-Thule or the golems. These pieces cannot be multi-quested or traded. In addition, a harbinger of Fear can advance the Whistling Fists quest in the same way as Cazic-Thule. Furthermore, a patch on April 22, 2015, added a work-around to obtain bottleneck items from Phinigel Autropos (Kedge Keep), Gorenaire (Dreadlands), and Talendor (Skyfire Mountains). - In Kedge Keep, a harbinger of the seas can help adventurers get their epic 1.0 pieces that would normally drop from Phinigel Autropos. - In Dreadlands, a harbinger of frost can help adventurers get their epic 1.0 pieces that would normally drop from Gorenaire. - In Skyfire Mountains, a harbinger of flame can help adventurers get their epic 1.0 pieces that would normally drop from Talendor. [ ](RAID) Red Dragon Scales from Nagafen in Nagafen's Lair or Talendor in Skyfire Mountains and Loot. (Nortlav the Scalekeeper in The Hole is also an option in later eras). [ ] Get Wax Sealed Note from Kargek Redblade in East Freeport. Keyword "Favor"
[ ] Get 2 Rebreathers from a Tinkerer. Buy a Keg of Vox Tail Ale from many different pubs. [ ]Give the Giant Sized Monocle to Mentrax Mountainbone in Frontier Mountains and Receive Rejesiam Ore.
[ ]Give the Severely Damaged Dragon Head Hilt, Rejesiam Ore, and Ball of Everliving Golem to Wenden Blackhammer in East Freeport. [ ] Combine both Dragon Head Hilts, the Ancient Sword Blade, and the Ancient Blade in Red Scabbard to receive the Jagged Blade of War. [ ] Combine the Jagged Blade of War in the Scabbed to seperate it into the Blade of Strategy and Blade of Tactics and vice/versa. The Warrior Epic quest begins with both Kargek Redblade and Wenden Blackhammer in East Freeport (click for map image). They can be found under a gazebo at -1300, -380 (just inside the North Ro gate). Find Kargek Redblade in East Freeport. Oknoggin Stonesmaker snatches the note from your hand and rips it open with your large hands. 'You take dis to Kargek. He want!' Oknoggin says, as he throws a tiny lute at you. You receive a Tiny Lute. Run back to East Freeport and give the Tiny Lute to Kargek Redblade to receive a book called Redblade's Legacy. Take the book over to his brother in East Karana - Tenal Redblade, who is at the very end of the canyon next to the ramp to Highpass. You receive a Frozen War Totem. Go back to East Karana and hand Tenal the Totem of the Freezing War and a Heart of Frost. He'll give you a Totem of Fiery War. Now get yourself a Green and Red Dragonscale (from Severilous in Emerald Jungle, and Nagafen in Naggy's Lair respectively). Go back to Tenal Redblade and give him the Totem of Fiery War, the Green Dragon Scale and the Red Dragon Scale. Tenal Redblade looks at you oddly as you hand him the scales. 'What are..? You have done well, mortal, and you will be rewarded if you are truly brave. Travel to the Plane of Hatred and slay the ancient bard who lives there. Do not return without his hand and this mark or you will never be a true warlord.' Tenal drops to the ground as the last words leave his lips. You receive The Mark of the Sword. You'll now need to go to the Plane of Hate and kill the Hand of the Maestro (note: Hand is now pullable without having to kill Maestro of Rancor). You need to loot the hand, which is a rare drop. Bring that back and give it to Tenal along with the mark. You receive Tenal`s note to Kargek. You now need a Spiroc Wingblade from the Spiroc Lord in the Plane of Sky. Take the Wingblade and the note to Kargek where he gives you the Red Scabbard and instructions on how to combine the Ancient Blade, Ancient Sword Blade, Finely Crafted Dragon Head Hilt, and Jeweled Dragon Head Hilt. Talk to Denken Strongpick on Aviak Island in the Ocean of Tears. a) A Keg of Vox Tail ale - bought from alot of vendors around the world. A good place to buy one is the sandfishers in North Ro or the Freeport Port Authority. b) A Block Of Permafrost - Dropped by Ice Giants. (while you're here, kill some goblin wizards until you find a frozen goblin heart -- you'll need it later). c) Two Rebreathers - Tinkered by Gnomes. Expect to drop as much as 4k for getting two rebreathers. You get the Ancient Sword Blade. The Ancient Blade is dropped by the Queen of Chardok. Bring along a large group of friends. Head to the chessboard in Timorous Deep. At the base of the King piece you'll find a Severely Damaged Dragon Head Hilt. Head back to Wenden. You'll also need a Ball of Everliving Golem. This drops from the named golems in the Plane of Fear: Fright, Dread and Terror. Since a march 2015 patch, you may also get it from a harbinger of Fear if the golems are not up. Now go to the Dreadlands, to the giant fort just west of Karnor's Castle. You need to kill the Mountain Giant Patriarch and loot a Giant Sized Monocle. Take the Monocle to Frontier Mountains. Get to the giant fort and get inside. When you get to the very end of the Mine you will see the giant named Mentrax Mountainbone. Now run back to East Freeport with the Rejesiam Ore, Ball of Everliving Golem and Damaged Dragon Head Hilt. Give these to Wenden. Wenden Blackhammer begins to work and hammer away at the hilt pounding the new material into it. You can see the metal shifting and moving in ways you have never seen metal move before. Wenden wipes his brow as he hands you a fantastic looking hilt. You receive a Finely Crafted Dragon Head Hilt. Head to Lake Rathe and pick up an Unjeweled Dragon Head Hilt. It can be found on the lake floor at +2513, +920, underneath the aviak tower. Then head back to Wenden. You'll need to get a Diamond, Black Sapphire, and Jacinth. They drop in various zones (Sebilis, Planes) and can almost always be found for sale in The Bazaar. Wenden Blackhammer begins to fiddle with the hilt, gently pressing the gems into place. It seems to take forever as you watch in silence. Wenden slowly places the last gem in place and gently bends the settings to hold the gems before he hands it back to you. 'That's a very impressive looking hilt there. The material it is made out of seems strangely familiar,' Wenden says as he turns back to his forge and his other work. You receive a Jeweled Dragon Head Hilt. As originally instructed, place the Ancient Sword Blade, Ancient Blade, Finely Crafted Dragon Head Hilt and the Jeweled Dragon Head Hilt into the Red Scabbard to receive your rewards. Combining the Jagged Blade of War in the Red Scabbard splits it into the Blade of Strategy and the Blade of Tactics. Combine the two blades in the Red Scabbard to get the two-handed version again. Added a quick guide/checklist for this epic. Let us know if there are any mistakes or errors so we can get them corrected. I completed the warrior 1.0 epic quest on my level 1 warrior on Firiona Vie server today. Wanted to address some of the information. First, the Hand of the Maestro, Ball of Everliving Golem, and Spiroc Wingblade are all no drop even on firiona vie but were able to be multiquested to the level 1. I completed these 3 tasks with a level 100 sk, which was nice for dealing with death touches. Death touches being the primary limiting factor for lower level players. Summary: Warrior 1.0 can be completed by any level (even level 1) on any server. Some servers deal with more no drop items, so it can be more tedious. Ancient blade = no drop all servers, CANNOT be multiquested. Maestro, Golem, wingblade = no drop, CAN be multiquested. Took me 4 days, with about 3.5 hours of dedicated gameplay; rest was afk camping. If not for the hand, would have done it in one evening. Heart of Frost - Took < 5 minutes to obtain mass killing. Item is tradeable. Looted from ice goblin wizard in permafrost. Was droppable on firiona vie server. Red Dragon Scales - Took < 5 minutes. Dropped down to the Hole, killed Echo of Nortlav. Already had item in bank to convert to green scale just in case so I did not have to wait for respawn. Green Dragon Scales - Took about 65 minutes total. Hoshkar did not drop it and old world mobs are still mass camped on firiona vie server. Luckily, can convert it and I did. TIP - I had to shroud down to earth elemental and give items to the conversion gnome in north ro. Worked fine for me without any problems. I got the centaur piece and fire giant piece in under 5 minutes in each zone. The terror was not up and took several rounds of respawn to pop for me. The link here has the exact /loc of his spawn point and pher which is giant wooly spider. All 3 components for the glue was droppable on firiona vie server. Hand of the Maestro - Took me about 3 days. If you're lucky, he'll be up. However, people passing by often kill it. I'm not 100% sure what to make of his spawn time. But, I know it took a little over 3 days after he and maestro were killed for me to see him again. He seems to be static and not triggered via place holders as other posts suggest. This can be multi-quested. Spiroc Wingblade < 5 minutes - For me, this was easy. I zoned in, he was up so I hopped islands and killed him eating his death touch on my shadowknight. This could be tough and on firiona vie, it appears as though this zone is still camped, so the tricky part is making it to the spiroc's island as progression mobs are often down. However, because of insta respawn of spiroc lord, when you're keyed, there is a good chance he will be up. This can be multi-quested. Think island respawns are from 6-12 hours. Block of Permafrost - < 5 minutes. Zoned in, killed random giants near vox area. Droppable on firiona vie. Keg of Vox Tail Ale - < 5 minutes. Actually bought mine from merchant in north ro while doing scales. 2x rebreathers - Took me 40 minutes to look into skill ups and level tinkering enough to attempt rebreathers on my gnome. Completed in PoK. If someone is selling this, certainly can be quick to just buy them. It is also actually not a cheap recipe. I made some stalking probes on my gnome to get tinkering 100+, then used firewater in some recipes to get 150ish. Took the chance and made some aqua lungs then rebreathers. Ending up sinking about 2k for both rebreathers to make them. I think about 4k to skill up enough to make a legit attempt. Ancient Blade - Took me 15 minutes. This could be tricky, but relatively fast respawn (3 hours?). She was up for me. I actually used my 95 mage for this. Got through locked doors by hugging door and casting illusion AA. Then, call of hero'd level 1 warrior and killed queen, looted blade. This item is no drop on firiona view and CANNOT be multiquested since it alone is one of the 4 items placed in the scabbard to create epic. Unjeweled Dragon Head Hilt - < 5 minutes - Hit the arena teleport stone in PoK. Swim and loot under the 3 spawn aviak tower. Severely Damaged Dragon Head Hilt - Took overthere teleport stone--> Translocator to Tim Deep. Certainly could go from butcherblock kaladim stone. Giant Monocle - I got this in one hour clearing giants in the big giant camp in dreadlands and any nearby. Patriarch spawned in big camp area and dropped monocle. Monocle was droppable on firiona vie server. The monocle is then turned in to quest npc in frontier mountains for ore.
Ball of Everliving Golem - Fright was up but did not drop piece I needed. Obtained via Harbinger of Fear. However, this is tricky. Warrior has to speak with harbinger to pop mob for the ball and ONLY a warrior can loot. I believe it has to be the warrior who spawned it, but I am not 100%. So, you can get a high level warrior friend, take them to fear, have them mq item for you. No drop on firiona vie. I multiquested this drop. Well, that's kind of rude, they nerfed the monk one to require level 46 via a flag but not all of them? I don't know if this has been posted before but if the nameds in Plane of Fear aren't up, go hail the Harbinger of Fear. As long as it's the right toon on the right step of the quest, he will pop. I just finished my Warrior epic 1.0 and have some information to pass on to those who are trying to complete it. I had no idea what I was getting into when I started it other than it might be a time sink.. it's really not too bad if you have the patience. Ball of Everliving Golem <- By far the worst and usually the last item acquired in the chain. This is found off one of the 3 Golems in Plane of Fear. I believe 2 of the Golems DeathTouch every 30 seconds or so. The other does not. Plane of Fear is constantly camped so chances for this to drop (will not drop every time) for you is small. I would highly suggest asking in General Chat every once in a while for a MultiQuest of the item. Just make sure you have everything else by the time you find a taker. Giant Sized Monocle <- Drops off a mountain giant patriarch in The Dreadlands. Clear the fort and definitely the area around it. I found this guy randomly roaming in the area. Green Dragon Scales <- Bought these for 1k. No idea where they come from... should be a quest "Dragon Scale Conversion" to get them. Keg of Vox Tail Ale <- My character was a Dark Elf and the lady in Freeport (near the docks) would not sell to me. Created a human paly, went in and bought it. Red Dragon Scales <- I went into The Hole for these. Echo of Nortlav was sitting at the bottom. He didn't aggro and fairly easy to take down. Do not grab the other guys near him. They will destroy ~55 toon. This was the only thing looted from this mob. Spiroc Wingblade <- The other "hard to get" item in the chain. Trying to get this solo will be more than a chore. This mob is on the last island (correct me if I'm wrong) in the Plane of Sky (PoS). He deathtouches ~30 seconds or so and will instantly respawn after he is dies. So, when you kill him, loot the body right away otherwise you might eat the next deathtouch. Ancient Blade <- Dropped off the queen in Chardok. Watch the trap holes on the way to her. I fell in the one near the queen and had literally about 14 mobs on me in no time. Block Of Permafrost <- Dropped by the Ice Giants near Permafrost keep. I'm sure there are things I missed, but hope this helps anyone having troubles. Good luck!! Please reply with any corrections, but there shouldn't be any, I used it and am holding the 1.0's as I type this. Heart of Frost from "a goblin wizard"
I am slowly building them. Oh YES! Thank you - absolutely awesome. First NPC's name is Kargek, not Kargak as listed here. Bold TextI decided to start my epic at level 55. I am on povar server. 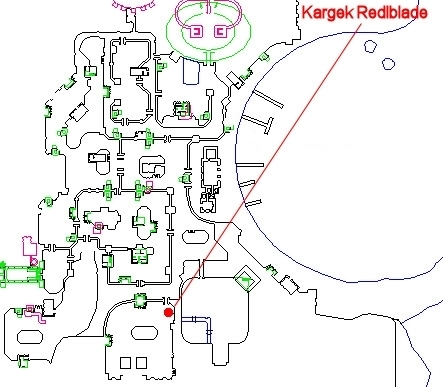 I had no difficulty in east freeport as the npc Kargek Redblade is clearly marked on the map. At leaset on mine he was. The npc Oknoggin Stonesmacker is located right were the loc key says he is. Actually Relativly close to the POK book. If you are looking at you map he is to the left over by the bridge. He conned indiffrently to my level 55 Drakkin Warrior. Handed him the note and he gave me the lute. So i went back to east freeport and turned the lute in to Redblade. He handed me the book to take to his brother in east karana. I ran to east karana and went over to the end of the canyon to highpass. Handed him the book and got my first totem. This took me about 2 hours to do. I am on dial up so might not take someoen else as long. So far all npc's are in the places Alla. hasmarked on the quest for the epic. gl to you if i find anything diffrent Ill post it. In regards to the Jeweled Dragon Head Hilt... for those that are interested... if you Hail Felodius Sworddancer at the very start of the canyon in East Karanas he asks if you want to hear a story. Respond with "a story?" and the next text only has one word with the [text] brackets. If you ask about an ogre legend and then follow the text and he tells you a little about the 2 blades and how they came to be and what gems to use. I don't know if this is anywhere in earlier posts as there are a lot. I'm am currently going through the text to see where it leads to as I type this post, any more info on this and it will be posted! Run back to East Freeport and give the Tiny Lute to Kargek Redblade to receive a book called Redblade's Legacy. [Tue Feb 23 04:55:03 2010] You gain experience!! Take the book over to his brother in East Karana - Tenal Redblade, who is at the very end of the canyon next to the ramp to Highpass. Hand him the book and receive a Frozen War Totem. [Tue Feb 23 05:11:25 2010] You gain experience!! Yes a few of these mobs Death Touch and you can't do it unless you have friends, and apparently the monk disc doesn't work anymore, don't quote me. Easy way to handle death touch mobs now are with mercenaries. With a healer mercenary you can just aggro something and eat Death Touch, mercenary rezs you and you have at least a 20 second chance on doing it yourself. Was easy with my SK. Just either Harm Touch to initiate the death touch and you come back and your mob is dead...or attack and when you come back you can Harm Touch. Managed to gather all needed items to MQ or to loot for an alt or a friend easily, just expect to get squashed a few times, no biggy. My warrior is doing this finally. We looked around for quite sometime using /loc before finding Oknoggin Stonesmacker. Although the loc for him is given it seems it can vary. We found him at +787, +1161, (N-W) He is next to the stone bridge deepest in the zone, NW corner just to the North of it. Notes here say he roams, I am not sure this is accurate as he has not moved from this location in over 10 mins now. Using a tracker would make finding him much faster of course. I hope this makes it easier and faster for you to find him. Hi, I need a little help getting started, I took my hubby's ogre war to freeport but he's kos there, how can I get started? I did this as well my warrior leveled to 3 from the mqs. I can't seem to get to the next island in Plane of Sky...can anyone help me?? Just kill urself and run back to Plane of Sky, a necro or SK can summon your corpse across islands, or find ppl who are keyyed and campfire to the island. 51 Berserker Dwarf- Honeyim Homenow. What is the deal with MQ's? I am wondering, why does everyone post asking for BoEG and Spiroc Wingblade MQ's (not sure what that is) rather than kill the mobs and loot them? I am noticing a trend here, and from my own experiences I will never be able to buy either of these MQ's (guessing that is what happens)? So can someone help me and tell me how are warrior's supposed to obtain their epic? The spiroc wingblade and ball of everliving golem drop from mobs that death touch. So even if you're higher level you will need some help. There is one mob in fear that drops the ball and doesn't death touch but finding him up is rare due to it being pretty much perma camped. Some of these items are no-trade and rare, and most people don't want to have to spend all their time camping these mobs until one of them drops. MQ means Multi-Quest, essentially it is when one person hands in part of the required turn in for the quest and then someone else, usually the person who is going to get the reward, hands in their part. PAYING 200k for a MQ of the Spiroc Wingblade on the Luclin Server. PST to Warmungar or SOE Email. well... getting frustarted. I have camped the ice giants in permafrost for a cpl days now. Waiting for them to respawn and killing them again...still no block of permafrost. Also.. I am trying to get a mq on the Ball of Everliving Golem. PST or in game email to Padilla on the tribunal. I have killed dread and fright ( the two hardest) with a lamb taking the DT and me and a cpl others burning them down. And the peice didnt drop on either. Frights AE spin stun is a blast =/. Anyway, any help on the BoEG would be great. WTB Ball of Everliving Golem and Spiroc Wingblade on AB server. Please send email to Revasluos ingame. WTB Ball of Everliving Golem MQ. Please send a tell or an in-game mail to Kuron, Urtog, or Spuculent.